Dillon to answer Bagenall's Appeal. 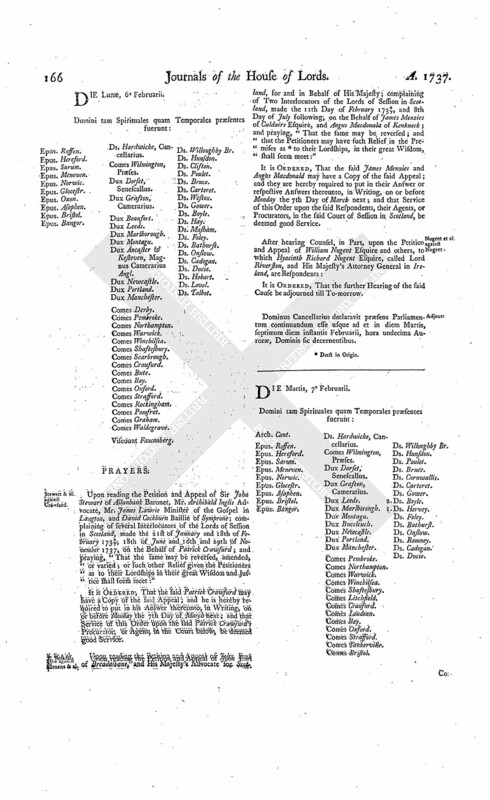 Upon reading the Petition of Walter Bagnall Esquire; setting forth, "That he formerly presented his Appeal to this House, against certain Orders and Decrees of the Court of Exchequer in Ireland; and that Edmund Dillon Gentleman was ordered to put in his Answer in the usual Time; which he has not yet done, nor is the Petitioner at present able to prove the Service of the said Order;" and praying, "That the Time given thereby may be enlarged:"
It is Ordered, That the said Edmund Dillon do put in his Answer to the said Appeal on or before Wednesday the 14th Day of March next. D. of Bedford's Pet. referred to Judges. His Majesty's Answer to Congratulatory Message. The Lord Steward reported to the House, "That the Lords with White Staves (pursuant to their Lordships Order of Yesterday) had waited on His Majesty, to congratulate Him on the joyful Occasion of her Royal Highness the Princess of Wales's happy Delivery of a Princess: And that His Majesty was pleased to return His Thanks to this House, for their Congratulation upon this happy Occasion; and takes it very kindly." French to answer Mercer's Appeal. The House was informed, "That Walter French had not put in his Answer to the Appeal of Robert Mercer, though duly served with the Order of this House for that Purpose." It is Ordered, That the said Walter French do peremptorily put in his Answer to the said Appeal in a Week. Dalrymple to enter into Recognizance for Sir Hew Dalrymple. The House being moved, "That John Dalrymple Esquire may be permitted to enter into a Recognizance for Sir Hew Dalrymple, alias Hamilton, on account of his Appeal depending in this House; he being in Scotland:"
It is Ordered, That the said John Dalrymple Esquire may enter into a Recognizance for the Appellant, as desired. Dominus Cancellarius declaravit præsens Parliamentum continuandum esse usque ad et in diem Jovis, secundum diem instantis Februarii, hora undecima Auroræ, Dominis sic decernentibus. Prince and Princess of Wales Thanks for the congratulatory Message. The Duke of Portland reported to the House, "That (pursuant to their Lordships Order of Tuesday last) he and the Lord Viscount Fauconberg had attended their Royal Highnesses the Prince and Princess of Wales, with the Message to congratulate them on the joyful Occasion of her Royal Highness's happy Delivery of a Princess; and that their Royal Highnesses were pleased to return their Thanks to the House, for the Joy they expressed at the Increase of the King's Family." Account of Greenwich Hospital delivered. The House being informed, "That Mr. Corbet, from the Commissioners or Governors of the Royal Hospital of Seamen at Greenwich, attended:"
"An Accompt of what Money has been received from the Derwentwater Estate, and what has been laid out in carrying on the Building of the said Hospital, in the Year 1737." And the Title of the said Accompt was read, by the Clerk. A Petition of James Hepburne Esquire and John Hepburne Esquire, Appellant and Respondent in the Cause which stands to be heard on Monday next, was presented, and read; praying, "In regard they are in Treaty towards an Accommodation of the Matters in Question between them, that the Hearing may be put off to such Time as the House shall think fit." Ordered, That the Hearing of the said Cause be put off to Monday the 6th Day of March next. He acquainted the House, "That the Parties were come to an Agreement, which was reduced into Writing; and that it was desired the same might be made the Order of this House." The said written Agreement was read, at the Bar. The Agreement was read, at the Table. 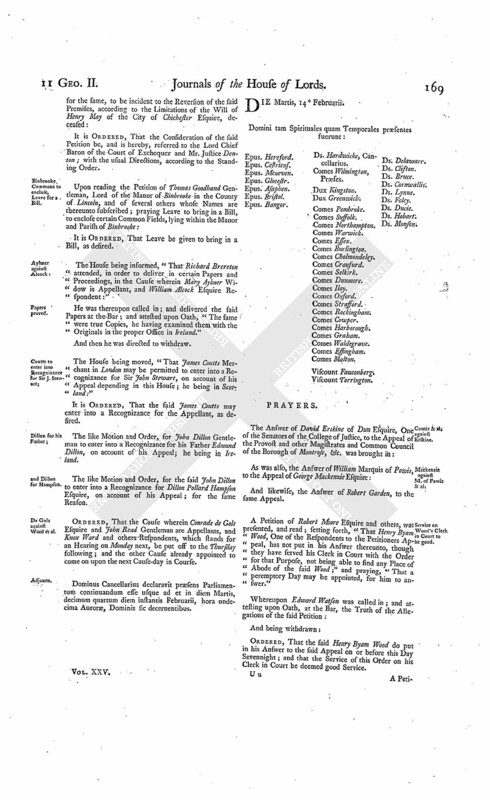 It is Ordered and Adjudged, by the Lords Spiritual and Temporal in Parliament assembled (according to the said written Agreement), That, upon Payment of the Principal Money, Interest, and Costs, paid by the Respondent in purchasing the Adjudications and other Debts and Securities affecting the Appellant's late Father's Estate; that the Respondent convey to the Appellant, or as he shall direct, all the said Adjudications, Debts, and Securities; and that an Accompt thereof be taken before the Court of Session in Scotland, in which the Respondent shall have Allowance of all Reparations, Improvements, and other just Allowances, the Respondent accompting for the Rents and Profits of the said Estate received by him, or by any Person for his Use; and that, previous to the taking of the said Accompt, the Appellant shall give such Security as the Court shall direct, for Payment to the Respondent of the Costs of all Proceedings in this Cause, as well in this House as in the Court of Session, to be taxed by the said Court within such Time as the said Court shall direct, in case the Appellant shall not redeem and pay the Money that shall be found due; and if the Appellant shall not give such Security, then the Interlocutors complained of shall be affirmed: And it is further Ordered, That the said Lords of Session do give proper Directions for carrying this Order and Judgement into Execution. Ordered, That the Cause wherein William Nugent Esquire and others are Appellants, and Hyacinth Richard Nugent Esquire, called Lord Riverston, and His Majesty's Attorney General in Ireland Respondents, which stands appointed for To-morrow, be put off to Monday next. Dominus Cancellarius declaravit præsens Parliamentum continuandum esse usque ad et in diem Lunæ, sextum diem instantis Februarii, hora undecima Auroræ, Dominis sic decernentibus. Stewart & al. against Crawfurd. 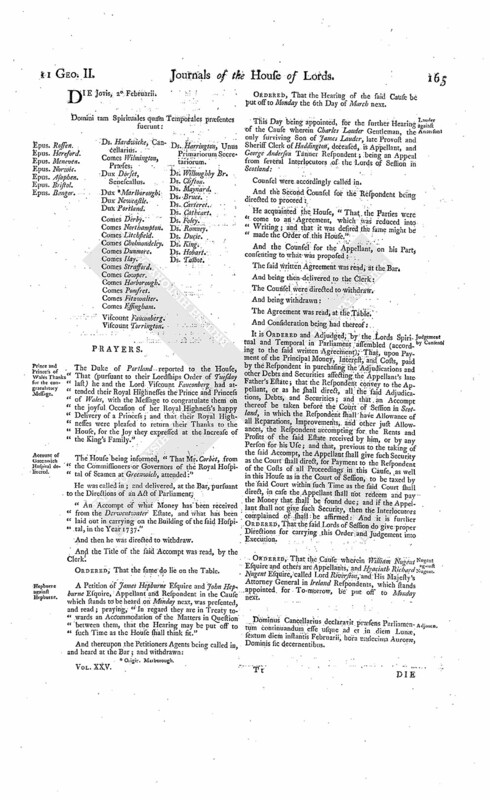 Upon reading the Petition and Appeal of Sir John Stewart of Allanbank Baronet, Mr. Archibald Inglis Advocate, Mr. James Lawrie Minister of the Gospel in Langton, and David Cockburn Baillie of Symprone; complaining of several Interlocutors of the Lords of Session in Scotland, made the 21st of January and 18th of February 1736/7, 18th of June and 16th and 29th of November 1737, on the Behalf of Patrick Crawfurd; and praying, "That the same may be reversed, amended, or varied; or such other Relief given the Petitioners as to their Lordships in their great Wisdom and Justice shall seem meet:"
It is Ordered, That the said Patrick Crawfurd may have a Copy of the said Appeal; and he is hereby required to put in his Answer thereunto, in Writing, on or before Monday the 7th Day of March next; and that Service of this Order upon the said Patrick Crawfurd's Procurator, or Agent, in the Court below, be deemed good Service. E. Breadalbane against Menzies & al. Upon reading the Petition and Appeal of John Earl of Breadalbane, and His Majesty's Advocate for Scotland, for and in Behalf of His Majesty; complaining of Two Interlocutors of the Lords of Session in Scotland, made the 11th Day of February 1736/7, and 8th Day of July following, on the Behalf of James Menzies of Culdairs Esquire, and Angus Macdonald of Kenknock; and praying, "That the same may be reversed; and that the Petitioners may have such Relief in the Premises as (fn. 2) to their Lordships, in their great Wisdom, shall seem meet:"
It is Ordered, That the said James Menzies and Angus Macdonald may have a Copy of the said Appeal; and they are hereby required to put in their Answer or respective Answers thereunto, in Writing, on or before Monday the 7th Day of March next; and that Service of this Order upon the said Respondents, their Agents, or Procurators, in the said Court of Session in Scotland, be deemed good Service. Nugent et al. against Nugent. Dominus Cancellarius declaravit præsens Parliamentum continuandum esse usque ad et in diem Martis, septimum diem instantis Februarii, hora undecima Auroræ, Dominis sic decernentibus. The Answer of Edmund Dillon Gentleman, to the Appeal of Walter Bagenall Esquire, was brought in. Nugent et al. against Nugent et al. And the Counsel for the Respondents having acquainted the House, "That they did not insist on that Part of the Decree which directs the Appellants to accompt for the Rents, Issues, and Profits, of the Lands in Question, from the Death of Thomas Nugent, Father of the Respondent Hyacinth Richard Nugent:"
It is Ordered and Adjudged, by the Lords Spiritual and Temporal in Parliament assembled, That so much of the said Decree as requires the said Accompt, and all Directions relating thereto, be, and is hereby, reversed: And it is further Ordered, That as to that Part of the Decree whereby the said Lands are directed to be held by the Respondent Hyacinth Richard Nugent, subject to an Annuity of Forty Pounds a Year to each of the Younger Sons of the said Thomas Nugent, for and during their natural Lives; as also to the Sum of Two Thousand Pounds for such of the Daughters of the said Thomas Nugent who were not provided for at his Death, these Words be added; (videlicet,) ["or to so much thereof as hath not been paid or satisfied to them, or either of them, since the Death of the said Thomas Nugent"]: And it is further Ordered and Adjudged, That the said Decree in all other respects be, and the same is hereby, affirmed. 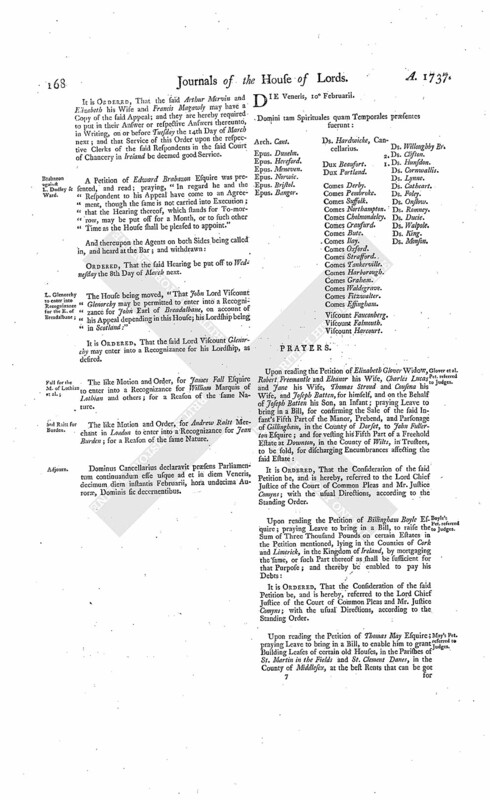 Upon reading the Petition and Cross Appeal of Edmund Dillon Gentleman; complaining of a Decree of the Court of Fxchequer in Ireland, made the 21st Day of February last, in a Cause wherein the Appellant was Plaintiff, and Walter Bagenall Esquire and others were Defendants; and in a Cross Cause, wherein the said Walter Bagenall was Plaintiff, and the Appellant Defendant; and praying, "That the said Decree may be altered; and that he may be relieved, according to the Prayer of his Bill, and have his Costs in both Causes; and that both Appeals may come on to be heard together; and that a certain Conveyance and Settlement in the Appeal mentioned may not, upon the Hearing, be permitted to be read, or given in Evidence; and that the Petitioner may have such other Relief in the Premises as to their Lordships shall seem meet:"
It is Ordered, That the said Walter Bagenall may have a Copy of the said Appeal; and he is hereby required to put in his Answer thereunto, in Writing, on or before Tuesday the 14th Day of March next; and that Service of this Order on the said Walter Bagenall's Clerk in the said Court of Exchequer in Ireland be deemed good Service. Upon reading the Petition and Appeal of Gerald Burke Esquire; complaining of a Decree of the Court of Exchequer in Ireland, made the 23d Day of February 1735, in a Cause wherein Thomas Blake Esquire was Plaintiff, and the Appellant Defendant; and praying, "That the same may be reversed, and such other Relief given the Petitioner as to their Lordships shall seem meet:"
It is Ordered, That the said Thomas Blake Esquire may have a Copy of the said Appeal; and he is hereby required to put in his Answer thereunto, in Writing, on or before Tuesday the 14th Day of March next; and that Service of this Order on the said Thomas Blake's Attorney in the Court of Exchequer in Ireland be deemed good Service. Upon reading the Petition and Appeal of Thomas Earl of Westmeath, in the Kingdom of Ireland; complaining of an Order of the Court of Exchequer in the said Kingdom, directing the Trial of an Issue at Law in the County of Cavan, made the 22d Day of June last, in a Cause wherein the Appellant was Plaintiff, and the Reverend Doctor John Madden Vicar of the Parishes of Kilmore and Ballentemple, and several of the Inhabitants of the said Parishes, were Defendants; and praying, "That the same may be reversed:"
It is Ordered, That the said Doctor John Madden may have a Copy of the said Appeal; and he is hereby required to put in his Answer thereunto, in Writing, on or before Tuesday the 14th Day of March next; and that Service of this Order on his Attorney in the said Court of Exchequer in Ireland be deemed good Service. Hampson against Mervin et al. Upon reading the Petition and Appeal of Dillon Pollard Hampson Esquire; complaining of several Orders or Decrees of the Court of Chancery in Ireland, made the 16th of November 1736, and 15th of July 1737, in certain Causes, wherein the Appellant was Plaintiff, and Arthur Mervin and Elizabeth his Wife, and Francis Magawly, were Defendants; and the said Arthur Mervin and his Wife were Plaintiffs, and the Appellant and his Trustees Defendants; and praying, "That the same may be reversed, and such Order made for the Appellant's Relief as to the House shall seem meet:"
It is Ordered, That the said Arthur Mervin and Elizabeth his Wife and Francis Magawly may have a Copy of the said Appeal; and they are hereby required to put in their Answer or respective Answers thereunto, in Writing, on or before Tuesday the 14th Day of March next; and that Service of this Order upon the respective Clerks of the said Respondents in the said Court of Chancery in Ireland be deemed good Service. Brabazon against L. Dudley & Ward. 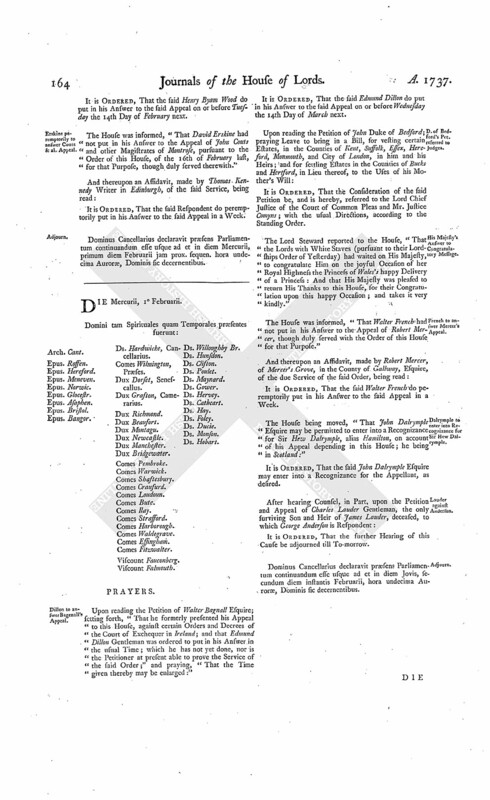 A Petition of Edward Brabazon Esquire was presented, and read; praying, "In regard he and the Respondent to his Appeal have come to an Agreement, though the same is not carried into Execution; that the Hearing thereof, which stands for To-morrow, may be put off for a Month, or to such other Time as the House shall be pleased to appoint." Ordered, That the said Hearing be put off to Wednesday the 8th Day of March next. The House being moved, "That John Lord Viscount Glenorchy may be permitted to enter into a Recognizance for John Earl of Breadalbane, on account of his Appeal depending in this House; his Lordship being in Scotland:"
It is Ordered, That the said Lord Viscount Glenorchy may enter into a Recognizance for his Lordship, as desired. The like Motion and Order, for James Fall Esquire to enter into a Recognizance for William Marquis of Lothian and others; for a Reason of the same Nature. The like Motion and Order, for Andrew Raitt Merchant in London to enter into a Recognizance for Jean Burden; for a Reason of the same Nature. Dominus Cancellarius declaravit præsens Parliamentum continuandum esse usque ad et in diem Veneris, decimum diem instantis Februarii, hora undecima Auroræ, Dominis sic decernentibus. Viscount Harcourt. Ds. Willoughby Br. Glover et al. Pet. referred to Judges. Boyle's Pet. referred to Judges. May's Pet. referred to Judges. Binbrooke Commons to enclose, Leave for a Bill. The House being informed, "That Richard Brereton attended, in order to deliver in certain Papers and Proceedings, in the Cause wherein Mary Aylmer Widow is Appellant, and William Alcock Esquire Respondent:"
He was thereupon called in; and delivered the said Papers at the Bar; and attested upon Oath, "The same were true Copies, he having examined them with the Originals in the proper Office in Ireland." The House being moved, "That James Coutts Merchant in London may be permitted to enter into a Recognizance for Sir John Stewart, on account of his Appeal depending in this House; he being in Scotland:"
It is Ordered, That the said James Coutts may enter into a Recognizance for the Appellant, as desired. 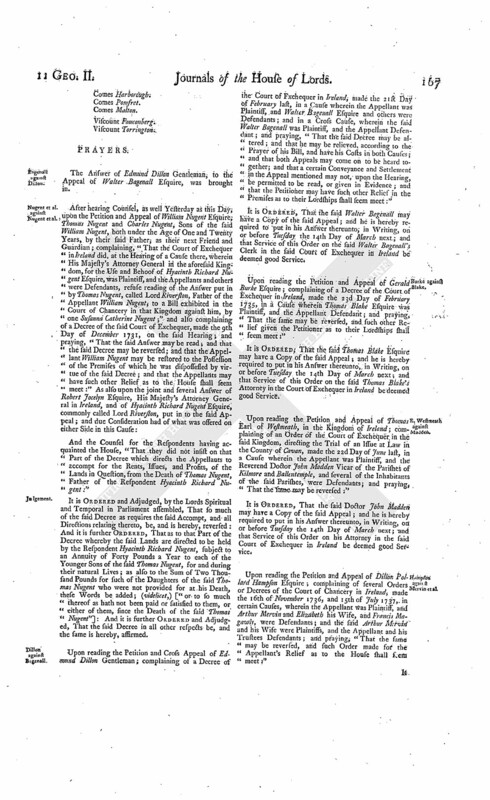 The like Motion and Order, for John Dillon Gentleman to enter into a Recognizance for his Father Edmund Dillon, on account of his Appeal; he being in Ireland. The like Motion and Order, for the said John Dillon to enter into a Recognizance for Dillon Pollard Hampson Esquire, on account of his Appeal; for the same Reason. De Gols against Ward et al. Ordered, That the Cause wherein Conrade de Gols Esquire and John Read Gentleman are Appellants, and Knox Ward and others Respondents, which stands for an Hearing on Monday next, be put off to the Thursday following; and the other Cause already appointed to come on upon the next Cause-day in Course. Dominus Cancellarius declaravit præsens Parliamentum continuandum esse usque ad et in diem Martis, decimum quartum diem instantis Februarii, hora undecima Auroræ, Dominis sic decernentibus.